When it comes to keeping websites secure, what we see is that companies are trying to sell people services of limited to no security value while important security practices go undone in many cases. One of the basic measures that needs to be taken to do that is to keep software running on websites up to date as that prevents known security vulnerabilities from being exploited, unfortunately that often doesn’t happen. In the past we looked at data showing this was true for the likes of Drupal, Joomla, and others. Yesterday, Revive Adserver put out a post showing what versions of their software are in use and they tell a similar story. Version 3.0.5 contains two moderate severity security issues that were fixed in versions 3.0.6 and 3.1.0, which were released in December. 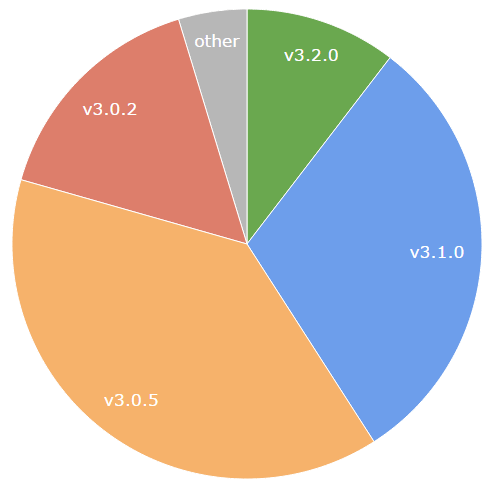 Versions 3.0.2 contains an additional moderate severity security issue that was fixed version 3.0.5, which was released a year ago. We haven’t seen any major issues when upgrading from these versions so there isn’t any excuse not having done this by now. If you haven’t been keeping Revive Adserver up to date now you should do that now (if need someone to do that for you, we can take care of that for you). For anyone who still hasn’t upgraded from OpenX you really need to do that now since that has more severe known security vulnerabilities in it at this point and the upgrade to Revive Adserver is relatively easy. On May 28, 2015 Daniel Therrien, Canada’s Federal Privacy Commissioner, previewed the OPC’s priorities for attendees of the International Association of Privacy Professionals (IAPP) Canada Privacy Symposium. The OPC will address these priorities through exploration of technological solutions, promoting good privacy governance, and enhancing public education. Other strategies to address these priorities will involve addressing challenges relating to privacy in a borderless world and the way in which these priority issues affect vulnerable groups. This priority focuses on the idea that personal information is a commodity. There is concern that the power relationship between consumers and industries favours the latter and that more regulation is required. The issue of obtaining consent in the online world, and whether that is realistically achievable in the continuously growing age of big data, is a continuing concern. This priority addresses the need to find the right balance between government collection and surveillance of its citizens for national security purposes while respecting its citizen’s privacy rights. Although controversial Bill C-51, the Anti-terrorism Act, may be enacted and come into force, the OPC is expected to be active in ensuring that Bill C-51 will be implemented in accordance with the Privacy Act, and report to Parliament and Canadians of any concerns. This priority includes concerns regarding the ramifications to not only the information individuals share online but the information that is collected and categorized about individuals by organizations as they utilize online resources. This priority may be restricted to educating Canadians but may also include taking a significant position on the right to be forgotten. The body as information priority involves the OPC’s efforts to stay ahead of the latest technological advancements and the related privacy concerns, including wearable devices and implants. Perhaps most striking are not the priorities themselves or the strategies to address them but Commissioner Therrien’s overall approach. In some areas, such as the economics of personal information, Commissioner Therrien has stated that the OPC will conduct broad stakeholder consultations prior to forming guidance. The OPC’s openness and direct engagement with stakeholders across Canada is a welcome theme of his first year as Commissioner. The OPC is expected to release its strategic report in June that will outline greater detail on the four priorities and upcoming activities it intends to launch. This post was co-authored by Karl Schober.